Update: I’m really honored to have won the America’s Test Kitchen ‘Dish it Your Way‘ Challenge! If you’re a blogger, you should consider entering yourself. The current theme is salmon. I’m passing on this round, but hope to make an appearance in some of the later rounds. 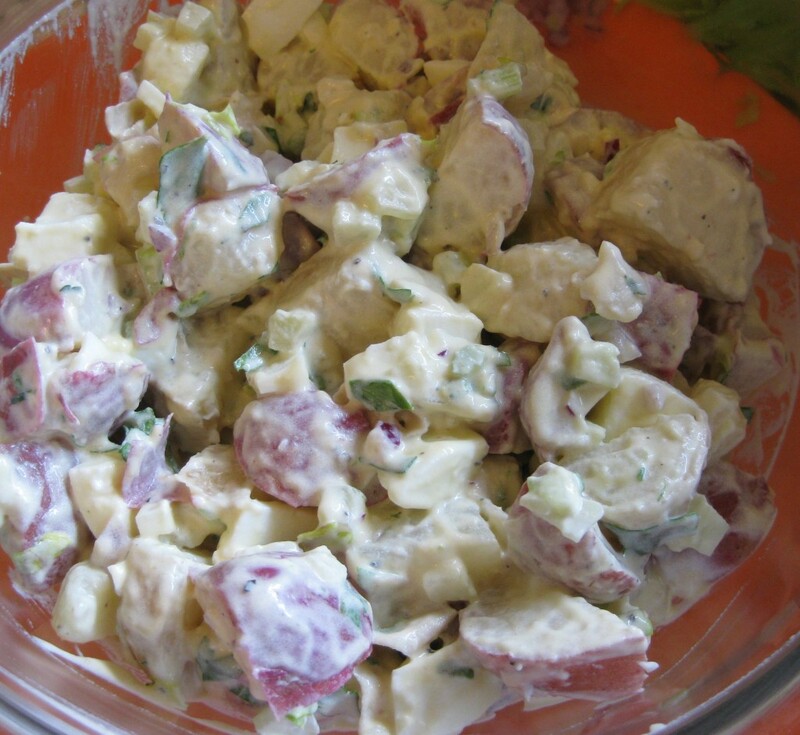 If you’re not a blogger, you should take a look at the fantastic entries for the challenges, including potato salad. Yum. One of the main things I miss about home (besides the people, of course!) is the food. I often crave particularly ‘upstate NY things’ like Hofmann hot dogs, barbequed chicken, salt potatoes and Friday night fish fries. But there are also those things I often want that aren’t specific to the region and that I can’t find here in Indiana. Sometimes I want the regular old foods that we just found darn good versions of around town. Potato salad is one of them. 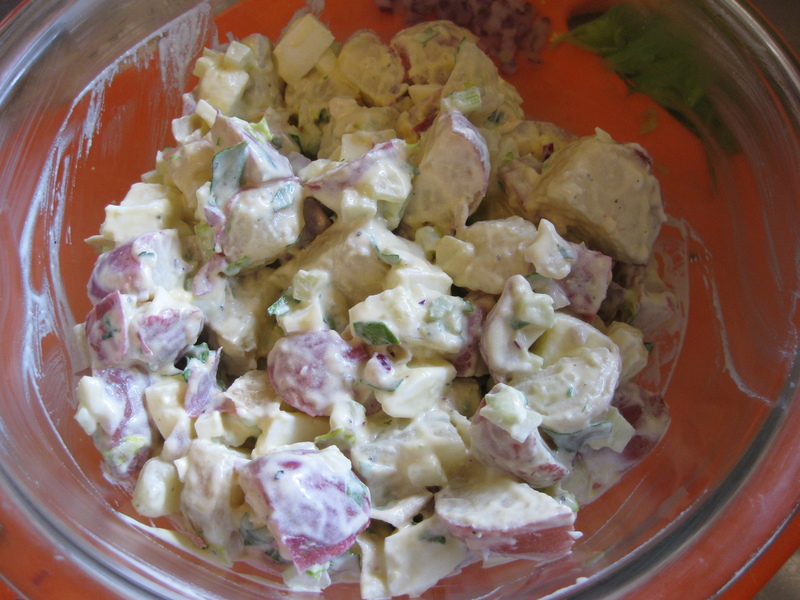 When America’s Test Kitchen announced the “Dish it your way blogger challenge” with potato salad as one of the themes, I thought it’d be a perfect opportunity to share the story of that potato salad. You see, this potato salad was not made by my mom, a local restaurant or a best friend’s grandma. Nope. It was made by a grocery store deli in the next town over. Sometimes we’d even make a trip to that town for the sole purpose of picking up a pound of potato salad from the Big M deli. This stop in the journey to recreate some of my favorite home meals was that potato salad (the hot dogs just simply must be imported). I took on the task of finding a sufficient replacement, and started where I always do, The New Best Recipe cookbook. I followed the recipe as written except for leaving out the pickles, in part because I didn’t remember them being in the Big M’s (also Chris hates them and I didn’t need to eat a whole batch of salad myself). And ya know what? I didn’t have to look further! I wasn’t the only one who liked it, either. Having brought it to several cookouts, I’ve left with more than a few requests for the recipe. Now, I could have just photocopied it and passed it along, but I’m a sucker for hand-written recipe cards. I was determined to write them out by hand on cute little recipe cards with my own little tips and tricks. Unfortunately, despite my best intentions, I’ve never been all that great about exchanging recipes. It took me no less than a year and a half to make sure the right people got it! I’d see them at church or walking downtown and cringe at the fact that I had been denying them the tastiest potato salad around. I finally sucked it up and wrote it out 3 times for various friends. But even in the height of barbeque season, I’m pretty sure none of them have made it themselves yet. Which is probably a good thing. Because if they did? It likely wouldn’t be like mine. Not because I’m a better cook than them. My friends are all very talented cooks! I have no doubt that they will easily put together a tasty potato salad. But something about theirs will be different than mine. Have you ever noticed that? The thing about exchanging recipes is that no matter how hard one might try, it’s never the same when you make it yourself. When they do finally set out to make it, it will turn out to be their own potato salad. Not America’s Test Kitchen’s, not mine and probably not the Big M’s. Theirs. And that’s the way cooking should be! 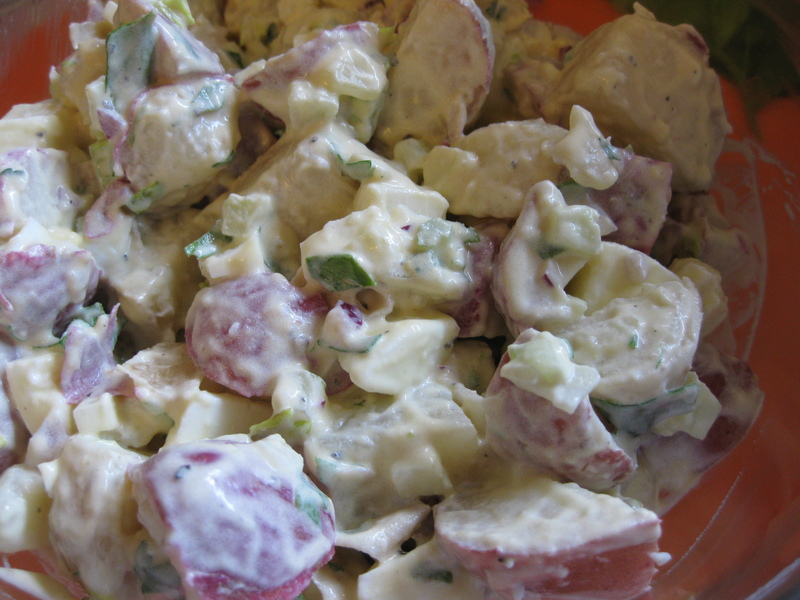 It’s called All American Potato Salad in The New Best Recipe. But I’m changing the name from now on. When I write out the recipe for people when they ask (hopefully a little more, ahem, promptly), I’ll use a new title. Your Potato Salad. Because that’s what following the recipe should result in. And let me just level with you here. I like this recipe well enough, and I’ve mentioned it’s a crowd pleaser. 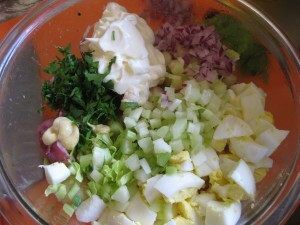 It will probably always be my ‘go to’ potato salad recipe. But I can almost guarantee that when I’m home visiting this summer, I’ll be stopping by the Big M for their potato salad. Because no matter how much I perfect my version, there will always be something different about theirs. Notes: The original recipe calls for red potatoes, but we’ve used Russets and whatever we have on hand with good results – this time it was new potatoes from our CSA. Russets actually contribute to making it a more gloppy salad since they’re mushier and we kind of like that. If you like a more tart salad, use the full 4T of vinegar. I don’t because Chris isn’t a fan of vinegar. Bring the potatoes to a simmer in a large saucepan covered with 1 inch of water on medium high heat. Reduce to medium and simmer until a paring knife can be slipped in and out with no resistance, 25-30 mins for larger potatoes or 15 – 20 for smaller ones. Drain and let the potatoes cool so you can handle them. Cut them into 3/4 inch cubes. 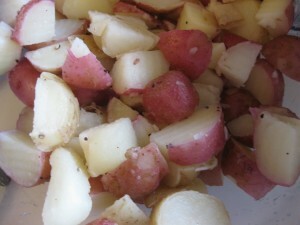 Place the warm, cut potatoes into a bowl and toss with the red wine vinegar, 1/2 t salt and 1/4 t pepper. Cover and put in the fridge to finish cooling – 20 minutes or until you finish prepping the rest of the ingredients. Toss the potatoes with the remaining ingredients and season with salt and pepper to taste. Serve up to yourself, friends and family alike! This looks great, I love your photos! Thanks! My goal this year was to learn how to use my camera. I’ve somewhat mastered taking pictures of food, but little else! Loved your chicken recipe from the last challenge! Thanks, Megan. I loved looking at the other entries, and am excited to see all of the other things bloggers ‘dish’ up next, too! I might walk away with a bunch of new recipes after this challenge! Hey, you’re famous! Very cool. Maybe this will provide some motivation when you’re feeling the blogging blues. Congrats on your win! Where in upstate are you from? My husband is from Binghamton. He mostly misses spiedies. OMG. Spiedies. I should have added that. For the longest time I would only eat pork chops that had been marinated in Spiedie sauce. Mmmm. I’m from north of Syracuse and South of Watertown, on Lake Ontario. Or as Indiana native Chris likes to say, ‘almost Canada’. Of course, it doesn’t help that the first time he visited there it was the dead of winter…. congratulations on the ATK blogger challenge! i love the idea of naming it ‘your potato salad’. so so true. i look forward to seeing more of ‘your’ recipes in the future. cheers! Thanks, Gretchen! Love the pictures on your blog! Good job Suzi! You are famous! 2 Pings/Trackbacks for "Your Potato Salad"